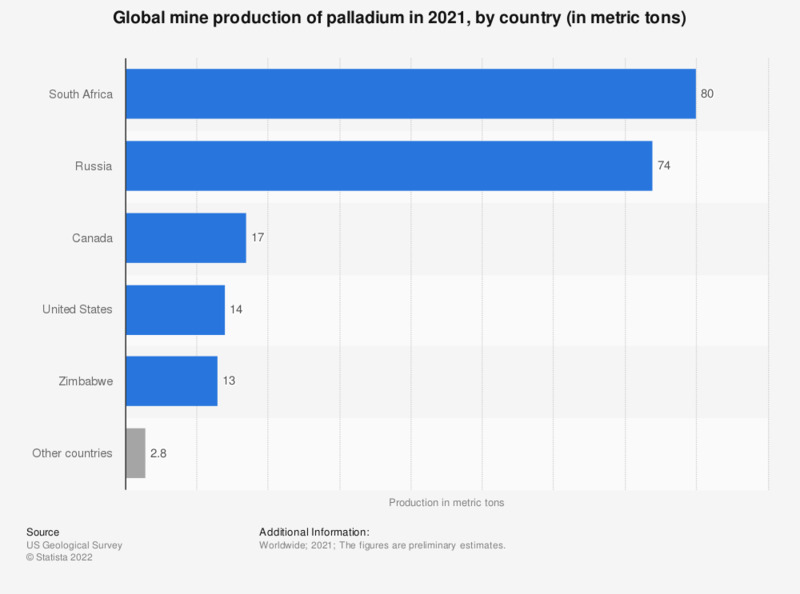 This statistic shows the global mine production of palladium from 2014 to 2018, sorted by major producing countries. The mine production in Russia reached an amount of some 85 metric tons in 2018. The average price of palladium was 690 U.S. dollars per ounce in 2015. Palladium is a metal, close to platinum in chemical composition, used primarily within catalytic converters, a key component of internal combustion engines that power the majority of motor vehicles produced worldwide. Almost two thirds of global palladium usage is attributed to catalytic converter production. Other areas of application for palladium are electronics, jewellery, medical purposes, dentistry, hydrogen purification, groundwater treatment, and other chemical applications. Palladium is a key component of fuel cells, which are used to convert chemical energy from fuel into electricity. Worldwide mine production of palladium fell in 2014 from higher levels in the years before. In 2011, some 215 metric tons of palladium was produced worldwide. Russia was the leading palladium producing country in 2018, followed by South Africa, Canada, and the United States. The top world palladium consumers are North America and China. The United States and China are also the two individual countries with the largest global market shares of auto production.